Clorox Freezer Bags - 1 Gal. Clorox Liquid Plumr Drain Opener - 32 Oz. Clorox Commercial Disinfectant Fresh Scent Spray - 19 Oz. Kitchen Bouquet Browning Sauce - 1 Qt. Kitchen Bouquet Browning Sauce - 1 Gal. K C Masterpiece Original Barbecue Sauce - 158 Oz. K C Masterpiece Original Barbecue Sauce Pail - 5 Gal. Green Works Manual Pot and Pan Dishwashing Liquid - 38 oz. Formula 409 Cleaner Trigger Spray Bottle - 22 Oz. Formula 409 Glass and Surface Cleaner Trigger Spray - 32 Oz. Formula 409 Cleaner-Degreaser - 1 Gal. Formula 409 Cleaner-Degreaser - 32 Oz. Clean-Up Disinfectant Cleaner with Bleach - 128 Oz. Pine-Sol All Purpose Cleaner Lavender - 144 Oz. Clorox Regular Concentrated Liquid Bleach - 30 oz. Concentrate Commercial Solutions Germicidal Liquid Bleach - 121 oz. Clorox Regular Concentrated Liquid Bleach - 64 oz. Clorox Clean Linen Liquid Concentrate Bleach - 64 oz. Glad Quick Tie Trash Flap Bag - 30 Gal. Bottled Hidden Valley Original Ranch with Bacon - 16 Fl. Oz. K.c. Masterpiece Marinade Honey Teriyaki With Sesame - 16 Oz. Glad Trash Can Liners Black - 39 Gal. Original Ranch With Milk Dry Canister - 16 Oz. Fresh Step Cat Litter - 7 lb. K C Masterpiece Original Barbecue Sauce - 18 oz. Bleach Germicidal Cleaner Trigger Spray - 32 Oz. Bleach Germicidal Cleaner Trigger Spray - 22 Oz. Glad Drawstring Tall Kitchen Trash Bag White - 13 Gal. Commercial Germicidal Bleach Liquid - 121 oz. Regular-Bleach Liquid - 64 Oz. Dips Mix Hidden Valley Fiesta Ranch - 1.1 Oz. Tall Kitchen White Garbage Bag - 13 Gal. Commercial Solutions Glass and Surface Cleaner - 128 Fl. Oz. Hidden Valley Original Ranch Mix Dressing - 1 Oz. Soy Vay Veri Veri Teriyaki - 10 Lb. KC Masterpiece Premium Blend Barbecue Sauce - 158 Oz. Concentrated Regular Liquid Bleach - 121 Oz. Hidden Valley Dry Buttermilk Ranch No Msg - 18 Lb. Clorox Fraganzia Commercial Solutions Multi-Purpose Cleaner Spring - 175 Fl. Oz. Clorox Fraganzia Commercial Solutions Multi-Purpose Cleaner Forest Dew - 175 Fl. Oz. Clean-Up Disinfectant Refill - 128 Oz. Clorox Liquid Germicidal Bleach Concentrated - 64 Fl. Oz. Soy Vay Veri Veri Teriyaki - 21 oz. Hidden Valley Easy Squeeze Ranch Dressing - 20 fl.oz. Soy Vay Island Teriyaki - 20 Oz. Soy Vay Marinade and Sauce Veri Veri Teriyaki Less Sodium - 21 Oz. Glad Trash Drawstring Can Liner Black - 30 Gal. Tilex Mold and Mildew Remover Spray - 16 Oz. Hidden Valley Caesar Dressing - 8.7 Oz. Honey Mustard Dressing Dip and Sauce Mix - 8 Oz. Simply Ranch Dressing Dip and Sauce Mix - 3.2 Oz. Clorox has an umbrella of top brands now for almost anything you do. Need salad dressing for your restaurant or home, try hidden valley from clorox. Need cleaners and disinfectants, clorox bleach, 409 spray cleaner, and pine-sol have you covered. 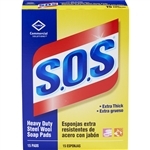 SOS soap pads are a favorite in commercial kitchens to clean pots and pans and clorox wipes are used throughout any restaurant facility to clean and disinfect.